This book infuriated me but also lowered the decibel level of my political retorts. I can clearly see now the utter cynicism with which Republican strategists set about grabbing as many seats as they could with the intent to hold onto them for a decade or more by controlling the redistricting process. “When you have power you exercise it.” The gerrymander is the reason Blue states can appear to vote Red. What is so pitiful is that we can still hear voters talking about what they believe like it actually makes any difference to the operatives in Congress. It is difficult to keep the partisanship out of discussions of politics, but I am going to try because the issue discussed in this book, gerrymandering, was/is really practiced by Democrats as well as Republicans. The Republicans, under the leadership of a legendary Republican campaign strategist called Lee Atwater, recognized in the 1980s that controlling the right to draw the lines of voting districts could mean greater Republican representation in local, state, and national races. They began a strategy which would not see results for thirty years. This decade it has come to fruition. Several states are laboring under gerrymanders so severely skewed to the Republicans that although Democrats win a majority of the votes, their representation actually falls. This book gives some of the background, especially for those states we watch closely in the national elections: Florida, Ohio, Michigan, Pennsylvania. An international non-profit which specializes in vote monitoring around the world turned its analytic eye on the United States, the “greatest democracy in the world” according to some, and discovered that North Carolina, Wisconsin, and Pennsylvania had electoral representation more skewed to favor one party than many third-world countries. Wisconsin, the state that brings you Speaker Ryan, has greater than 50% Democratic votes but has 60+% Republican seats. Wisconsin’s redistricting is currently handled by their Republican legislature, which allowed the national Republican party, with funds provided by Koch Brothers, to draw their redistricting maps. In closed sessions, deep secrecy, late night and storm days they would gather to prevent transparency of their process and to ensure Republican voters were the largest voting block in most districts. Even in a largely Democratic state, they managed to break, stack, crack, pack the districts with enough Republican voters to grab Congressional and state seats, and the governorship. Wisconsin used to be a Deep Blue state. In November 2016 a federal court ordered that the voting districts in Wisconsin be redrawn by November 2017. Wisconsin Republicans (including Paul Ryan) refused, and appealed the decision to the Supreme Court (SCOTUS). Meanwhile, voters in Wisconsin are seriously disenfranchised. This is happening now, folks, and can be watched as it progresses through the courts. Pennsylvania is the third most voter-obstructed state. Last year a youth pastor, Carol Kuniholm, noticed extraordinary discrepancies between the schools in some city districts and suburban schools and discovered one of the main reasons was underrepresentation due to gerrymandering. Kuniholm began a movement in PA which has taken on enormous momentum within the state and is garnering national recognition. You can watch progress of her attempt to introduce a bill to require an independent nonpartisan committee to decide contiguous, compact districts that do not break communities, cities, or racial blocks at fairdistrictspa.com. She wants nothing less than the democratic process to work as intended. 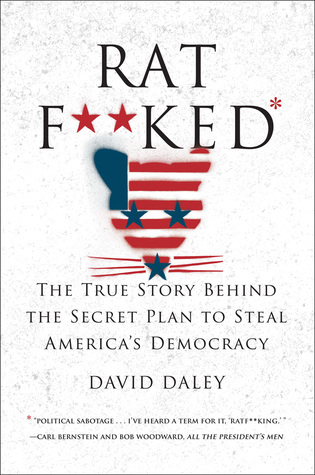 Daley shows that state legislature-managed redistricting can be severely partisan and that citizens in some states have managed to pass referendums requiring a nonpartisan independent committee to manage redistricting. The independent committee works well in Iowa but is still subject to vicious partisan wrangling in Arizona. Some academics have taken on the challenge of trying to envision a better, more democratic process and Daley discusses these at the end of his book. The GOP will keep Trump around as long as he can sign stuff and listens to what they say. So, okay. This is what we are dealing with. It means we need to pay attention, focus our energy, rely on each other, and tell our legislators we want fairness and representation. This book is a very easy read because it is so eye-opening. It gives you the basics, suggests a fix, and points a direction. What more do we need? What maddens me the most is the collaboration of the Supreme Court in going along with the disenfranchisement of so many voters by allowing the gerrymandering to be so extreme. The other shoe that always threatens to drop, especially in "blue" states controlled by "red" districts like Pennsylvania is the idea to award state electoral votes not by winner-take-all or even by proportionality but by--you guessed it--Congressional district. When that happens, there will no longer be any reason to vote at all, since Trump has shown beyond a shadow of any doubt that party loyalty is the pre-eminent motivation for the majority who go to the polls. You are completely correct that earlier challenges to gerrymandered districts have been adjudicated by SCOTUS without satisfying some of the basic underlying problems that all victim states share. I suppose it was a calculation by those bringing the lawsuits: do we get a narrow decision in our favor that fixes our issue or do we try to broaden the ruling and perhaps lose the case? You raise a critical point that gerrymandered districts do not necessarily affect presidential races, but do affect the Congressional elections every two years. I am just beginning to learn about this subject, but I wasn't aware using voting districts to inform the electoral college was a discussion. That would be truly horrifying unless the mapping were proper. I have a feeling districting and the electoral college will be eliminated before your fears are realized. Don't know if you read this one already, Zak, but the last chapter which discusses possible fixes is kind of rewarding. I mean, if the present system is so completely subject to corruption, it might be better to be rid of it completely. I find the notion pleasing--that the system both parties have put so much effort into skewing might be smashed around them. That would be a very pleasing notion. I haven't read this one yet, but will be at the library tomorrow. And, by the way, NH has its own gerrymander problem that is affecting voting.